CAPE CANAVERAL, Fla. – NASA is packing up a 300-pound robot helper for a trip to the International Space Station later this year. The humanoid robot, called Robonaut 2, is not exactly riding first class into space. 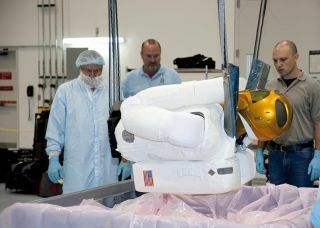 Instead of a seat alongside its human counterparts, Robonaut 2 is being packed into a foam-padded stowage unit for its planned November launch on the space shuttle Discovery, NASA's deputy Robonaut project manager Nic Radford told SPACE.com. Radford and other members of the engineering team demonstrated the robot’s capabilities to reporters this week in the Space Station Processing Facility at NASA's Kennedy Space Center – the home port of the space shuttle fleet. Robonaut 2, or R2 for short, will launch on space shuttle Discovery as part of the STS-133 mission that is currently scheduled to lift off Nov. 1. It will be the first human-like robot to become a permanent resident at the space station. The robot even has its own Twitter account (@AstroRobonaut) where its human handlers are posting updates for the automaton's mission. "Just powered down for the last time. Next time I power up will be on the ISS!" the R2 unit's handlers wrote for the robot Friday. The dextrous robot resembles a human and is specifically designed to operate like one. It consists of a head and torso with two arms and two five-fingered hands. Advanced control and sensor technologies allow R2 to operate as an assistant to the station astronauts. Diftler demonstrated the sensitivity of R2’s components by placing his hand in the robot’s hand. As he began the handshaking motion of pumping up and down, R2 recognized the action and effectively shook hands with his project manager. At the moment, R2 has limited mobility, but in the future, the greatest benefit of humanoid robots in space may be as assistants or stand-ins for astronauts during spacewalks, or for other tasks that are too difficult or dangerous for humans, Robonaut designers have said. Future enhancements and modifications may allow R2 to move freely around the station’s interior or outside the orbiting complex. NASA is hoping to develop a phased approach to R2’s upgrades, which could include the addition of vision, mobile and vocal components in the future. These upgrades will largely be based on the robot’s performance on orbit, in addition to adequate funding for the project. In fact, a more mobile version of R2 may already be close on the horizon. “Pending funding, we could have something up in 18 months,” Radford told SPACE.com. Robonaut 2 was developed by NASA in partnership with General Motors (GM) under a cooperative agreement to develop a robotic assistant that can work alongside humans, whether they are astronauts in space or workers at GM manufacturing plants on Earth. Many of the tests and procedures being conducted on R2 also benefit the team at GM. The automaker plans to use technologies from R2 in future advanced vehicle safety systems and manufacturing plan applications. The idea of using dextrous, human-like robots that are capable of using their hands to do intricate work is not new to the aerospace industry. The original Robonaut 1 designed for space travel was built by the software, robotics and simulated division at Johnson Space Center in Houston, in collaboration with the Defense Advanced Research Project Agency 10 years ago.